A top 25 finalist in the Electrolux Design Lab competition has imagined a fridge that uses zero energy and cools by suspending food in a bio-polymer, gel-like material. Refrigerators are the second biggest energy zappers in household appliances today (about 13.7%), next to air conditioners, which use about 14.1% of the total household power expenditure. Since the refrigerator’s urban genesis in the mid-20th century, we’ve managed to refine their energy expenditure from 1400 kWh/year to about 350 kWh/year on average, an impressive 75% reduction. Even so, modern designers and innovators are working diligently to reduce this number to zero. 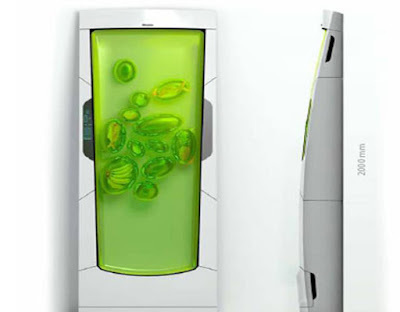 Coming out of the Electrolux Design Lab competition is Russian designer Yuriy Dmitriev’s Bio Robot Refrigerator – a sleek, wall-mounted fridge that cools our food in the most peculiar of ways: by shoving food into an odourless, non-stick bio-polymer gel. 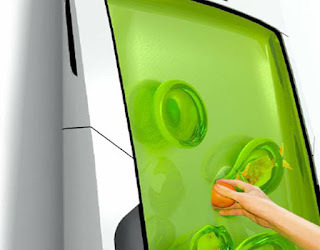 His Bio Robot Refrigerator utilizes a special gel-like substance that suspends and cools food once inserted. Dmitriev’s design was one of 25 finalists in the Electrolux Design Lab competition, which challenged entrants with the task of redesigning modern appliances for the future. The Bio Robot Refrigerator mounts on a wall — Dmitriev points out it can be mounted horizontally, vertically or even on the ceiling. The fridge does not have a motor or other traditional technology like most refrigerators, — the gel does all the work — so, 90% of the appliance is actual usable space. To use the fridge you basically shove food into its biopolymer gel — which has no odor and is not sticky — and it is suspended and cooled until you need it again. Dmitriev notes that the cooling agents are the “bio robots” inherent in the gel that use luminescence — light generated in cold temperatures — to preserve food. Although this sounds super techy and fun, Dmitriev doesn’t really explain how it’s going to work, so we’re a little skeptical of the Bio Robot Refrigerator becoming a reality someday.